Glasflex PVC Ducting is a flexible Ventilation Ducting, suitable for welding fumes and general light duty heating and ventilation. Available in 6 metre lengths. Sizes from 40mmID to 610mmID. Flexflyte U1 Neoprene Ducting is a high temperature Flexible Ducting made with high tensile spring helix, covered with Neoprene-coated and impregnated glass fibre fabric, with an outer cord of neoprene coated glass fibre. For conveying hot or cold air, fumes or light non-abrasive dust at low pressures. Its extreme flexibility makes tis duct excellent for installations where space is at a premium. Flexflyte L1 2-ply Neoprene ducting also available. This is a 2-Ply Flexible Neoprene Ducting with a smooth inner lining, suitable for temperatures to 150 Deg C. Available in lengths of 4 metres. High Temperature Flexible Silicone Ducting, highly flexible heater ducting with a high tensile spring helix, covered with silicone coated and impregnated glass fibre fabric, with an outer cord of silicone coated glass fibre. 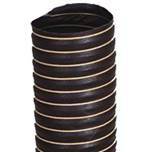 This ducting is ideal for handling air and fumes where extremes of temperatures are involved. Flexflyte L8 2-ply silicone ducting also available. This is a 2-Ply High Temperature Silicone Ducting suitable for fume extraction, exhaust extraction and conveying hot air to temperatures up to 300 Deg C.